Graphene Oxide (GO range) are super thin (<1nm) naturally hydrophilic support films. Please note: Pre-treatment of GO support films is not necessary before using. The hydrophilic surface will facilitate the even spread of particle suspensions across the grid. We would actively discourage any form of plasma cleaning or glow discharge as it will damage the support film. 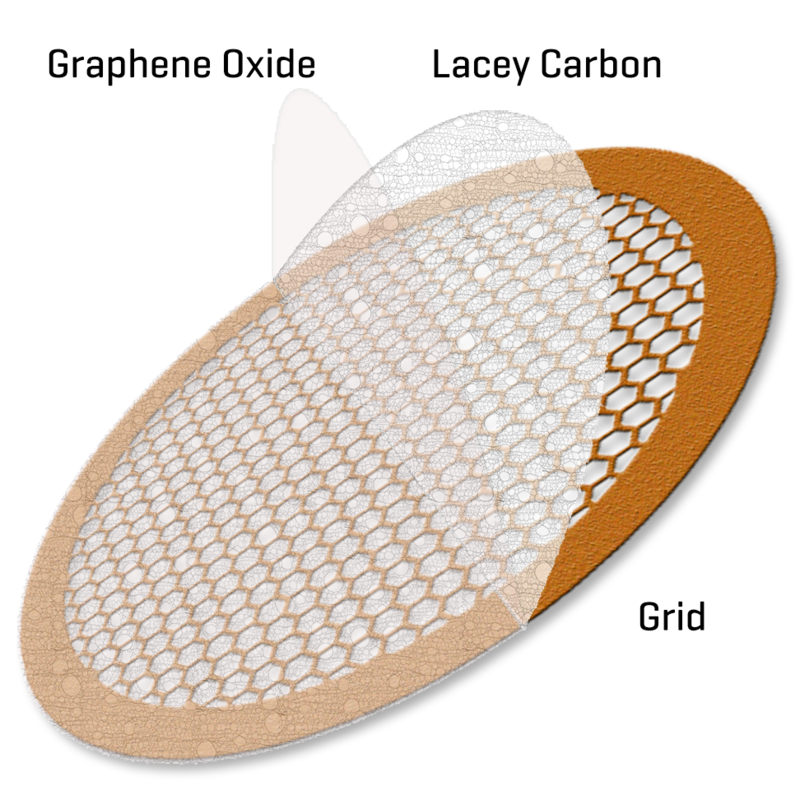 Graphene oxide support films are available on Holey Carbon , Lacey Carbon and Quantifoils R1.2/1.3, R2/2 and R2/4. If you require GO on other types of support please contact us to discuss your requirements. GO support films are also available on R2/2 R2/4 and R1.2/1.3 Quantifoils. The hole at position A has no GO film and thus no Ferritin particles. The hydrophobic nature of an amorphous carbon film is also shown at position B where there is no GO and the Ferritin is irregularly dispersed, tending to clump around the holes in the Lacey carbon. Position C showns a single layer sheet of GO spanning one of the holes and the effect on the particle distribution. The difference in background contrast between Carbon, GO and no support film can clearly be seen in this area. The hydrophilic nature and advantages of a GO support film are shown across the film on the left of the image (position D) with the more even distribution of the Ferritin on the thinner GO support film. DNA which is first treated to get it to linearize, readily sticks to an untreated GO support film. It can be difficult to get DNA to stick directly to a carbon film so the ultra thin, hydrophilic nature of a GO support film opens up new possibilities for this, and other applications. Recently published work using DNA also shows GO support films gaining acceptance for cryoTEM studies.